I attempted to create nori rolls several months ago and failed miserably. I have since learned that you have to actually moisten the nori paper to make it pliable enough to work with and so preventing it from crumbling when you try to wrap it. I admire and aspire to create rolls that are beautifully wrapped and mastered by the skilled sushi chefs of the world. Someday…someday. I started these rolls by doing a lot of prep work. Now, don’t be scared off by the thought of doing prep work. It actually didn’t take nearly as long as I thought it would. A little bit of chopping and organizing in the beginning will make for quick and easy assembly time. And last but not least, Raw Nori Paper. I searched high and low for the raw stuff around my city, with no avail. So, I had to settle for plain old roasted seaweed sheets, the same ones they use for sushi. It’s NOT the end of the world. I found packages of sheets precut into 1/4 segments (meaning a quarter of the original size of a standard sheet). Perfect! Premoisten the seaweed strips by placing them between two wet paper towels for about 2 minutes. If you have a sushi rolling mat, now would be the time to break it out, dust it off and start using it. If you are not lucky enough to have one, your fingers will have to do. Lay the sheet on a plate. Place 1 strip of each of the veggies onto the edge closest to you. 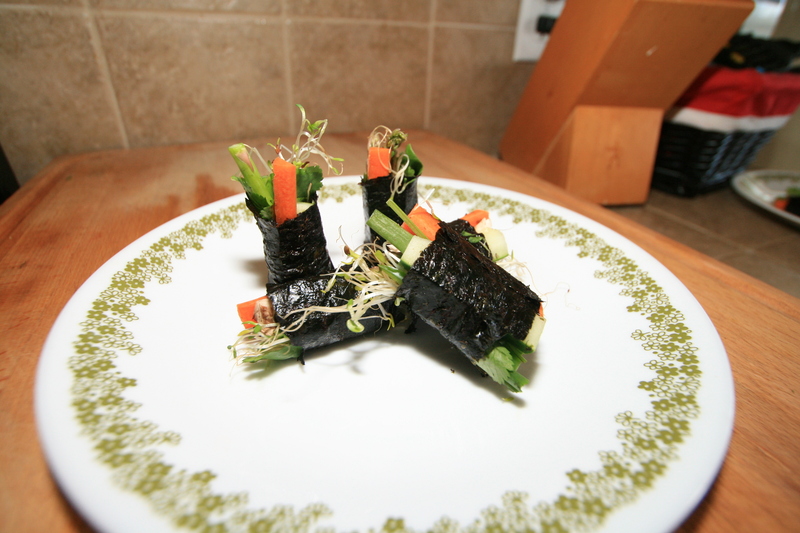 Gently but tightly begin to roll the seaweed strip around the veggies, rolling it away from you till the two ends meet. The seaweed should stick to itself. If not, you can dip your finger in water and run it along the seam to seal it. Set it aside and let it sit for a few minutes to allow it to fully seal. These may be cut in half for more bite sizes or left as is. This sauce tip came from a traditional sushi chef I encountered at my local super market.